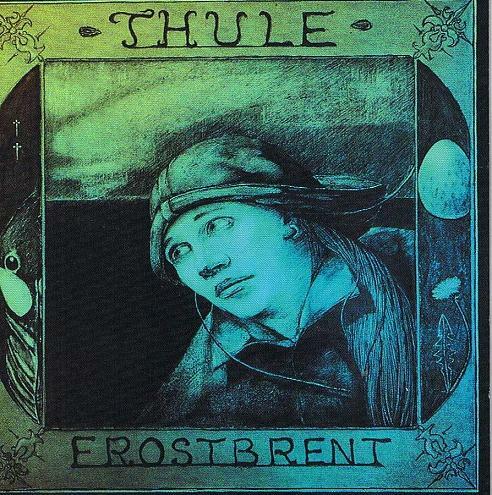 Frostbrent is the third album by the now three-man Norwegian outfit Thule. Again, here's an album esoteric enough that it could only find its market in the underground progressive scene, yet straightforward enough that I can barely relate it to anything that I would normally or vaguely define as progressive. No, it's not neo-prog either, it's a bit too much on the heavy side for most of the symphonic groups, and anyway there are very few keyboards on it like there was on its predecessors Ultima Thule and Natt. The songs are incredibly short and designed to be that way and for the most part the arrangements are quite predictable. The influences are quite unusual — Roger Water's Pink Floyd (yet less so than they have been), Midnight Oil (some songs sound exactly like them), Rush, and a small influence by either Gothic metal bands or the Seattle grunge scene. It's close in a lot of ways to some of the new music on Italy's Black Widow label (Runaway Totem or Malombra) yet much less complex or involved — short compositions, little or no atmosphere and a lot of sameness between tracks. I doubt this will hit high with many prog-fans of any type although you couldn't probably find anyone who wouldn't like a track or two on it. It's dark Gothic sound that worked well on Natt (similar in ways to Halloween on Laz) doesn't seem to work well in this pared down format. I'm not sure who I'd recommend this to, I found it rather uninspiring.